Kaley Carling is a Utah woman married to her high school sweetheart, Jeremy. One of their biggest dreams was to become parents, but Kaley’s rheumatoid arthritis and lupus had taken a toll on her body and efforts to conceive were exhausting. After two years of trying to get pregnant, the couple took a break from trying and focused instead on foster care and adoption, something that Kaley had dreamed of since she was a teenager. This picture just makes you smile, doesn’t it? But, the happy ending comes at the end of a long hard road and a lot of stars lining up just so. The Carlings became foster parents to Indie (now two) and Haven (now 14 months) last August — August 11th to be exact. They had been through two failed adoptions when they got “the call” that Indie and Haven would be placed in their home. But that wasn’t the only “the call” the Carlings would get that day. August 11th also marks the day that this Utah family got a call from a birth mother in Arizona that was carrying twins! The family had been pursuing adoption on their own, meaning independent of an adoption agency, because their funds had dwindled after two failed adoptions. They had exhausted much of their financial resources preparing to adopt a baby who’d been born in July 2015. The birth mother opted not to press forward with the adoption. Haven’s and Indie’s adoptions were finalized on October 19th 2016 and the twins, Weslie and Sunny, were officially adopted on October 20th, which was coincidentally their new, proud (albeit now totally outnumbered) father’s 30th birthday. I know. What a crazy, wonderful story, right? We look at these pictures and we see smiles and genuine joy, but this family has had their share of struggles along the way. One of the twins, Sunny had to stay in the NICU following her birth. 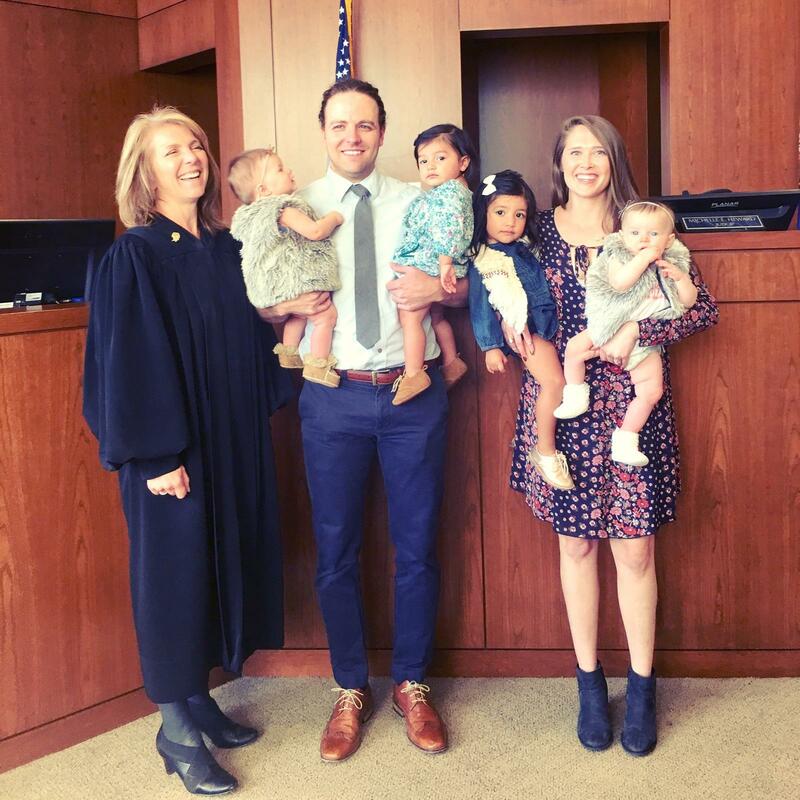 The family shuttled back and forth between Arizona and Utah, juggling adoption paperwork, bonding with babies, and family separation. The family is also still feeling the aftershocks of two failed adoptions. The most recent failed adoption came to a tragic ending after the Carlings were out of the picture: the birth mother was subsequently incarcerated and the baby and her maternal grandmother were killed. The family is in a place of happiness today. See also a place of sleep deprivation, but happy sleep deprivation. Sunny is out of the NICU, home in Utah and thriving. The Carlings have just moved from a two-bedroom townhouse to a larger home that can accommodate their larger family and the family dog. The home is owned by Kaley’s parents who are letting them live there while they save up for a home of their own that will hold their expanding family. They’re living out of boxes but call themselves lucky. The Carlings have supportive and enthusiastic family nearby. My interview with Kaley Carling was via phone. I thought I heard a little catch in her voice as she shared her passion for foster children. I could have been imagining that. As the mom to an adopted child who spent almost two years in foster care, the catch I thought I heard in Kaley’s voice might have brought tears to my eyes. Maybe. Adoption and foster care are special. Having your dream of becoming a parent realized, no matter how that happens, is special. Tiring. Exhausting. Sticky. Messy. But special. November is National Adoption Awareness Month and you may see other touching adoption stories in the news and on social media. I think you’ll agree that this story is in a league of its own. Congratulations, Carling family and Happy National Adoption Month. Something tells me there’s going to be some epic parties at your house on October 20th from here on out. Kaley’s aunt has established a Go Fund Me to offset some of the Carlings’ adoption, housing, and travel expenses.